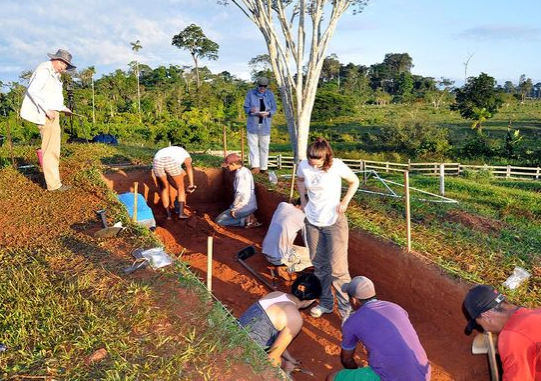 Archaeologist Martti Pärssinen has made sensational finds of an ancient civilisation in the Amazonian area. The summer’s digs in Brazil have unearthed unique artefacts, including entirely new forms of ceramics. The clearing of the Amazon rainforest has revealed mysterious patterns in the earth. The large-scale patterns are best visible from the air, where Finnish archaeologist Martti Pärssinen takes pictures of them. The geometrical patterns have been made with earth mounds and moats. Many of them are huge, with sides measuring up to a few hundred metres. Over 300 such structures have been discovered in the Brazilian state of Acre alone. The construction feat involved can be compared to that achieved by those that built the pyramids in Egypt. Pärssinen points out that people here must have expended as much energy as the workers in Egypt, shaping the earth into vast motes and mounds, in complex, multiple structures. The find has been a sensation for researchers, as it was previously thought that much of the Amazon was merely sparsely populated, wild rainforest. Graduate student Ivandra Rampanelli from Spain's University of València says the patterns are rewriting the history of habitation of the Amazon – an area that was before seen as devoid of great civilizations. Radiocarbon dating shows the oldest patterns were built some 2,000 years ago, and that the civilisation suddenly ended 700 years ago, possibly due to foreign diseases brought by Europeans. Now the archaeological excavations are shedding light on the life of this ancient people. Record quantities of ceramics have been unearthed, including 300 kilograms of pot shards. Some of the ornamentation on these is totally new to science, while other figures prove connections with faraway populations in the Andes. Pärssinen couldn’t be more excited, noting that this may be one of the last places in the world where such rich findings can still be made. Almost everything that is discovered here brings new knowledge of the past, he says. You can watch a TV report on this story here.